We're back to cold, wintry days here after the teasing by that Spring-ish weather. I'm not sure if it was the contrast of those few warm, sunny days with this snowy, cloudy day, but it just felt so dark all day long! So, I lit a few candles while I worked in the kitchen this weekend. My goal was to make a nice big pot of marinara sauce from my dad's shared tomato bounty a few months ago. I didn't have a chance to process all those tomatoes at the time, so they got washed and stored in the freezer until now. 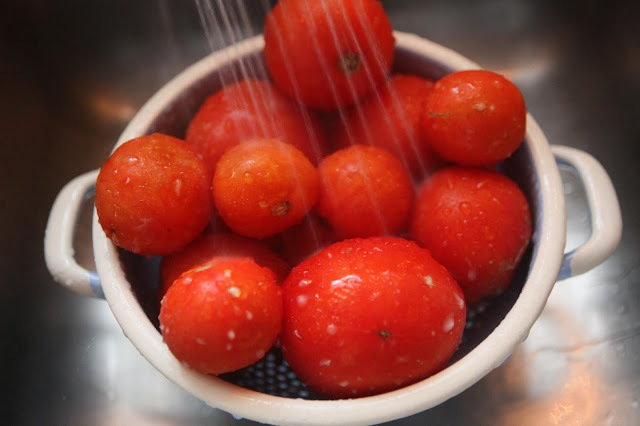 I simply emptied them into a colander, and ran a little warm water over them to defrost them just enough for chopping. Because I run the sauce through the food processor at the end, I don't worry about de-seeding and de-skinning the tomatoes (although some skins do naturally peel off during this process), and don't mind the more blush, rosy colored marinara that leaving the seeds in tends to give. 6. Blend the whole batch. We like ours to have a bit of texture, so I blend it just enough for it to be thick and still a little chunky. This is a great base for any kind of red pasta sauce or pizza sauce. More often than not, we eat ours with homemade spaghetti noodles and meatballs, and a side of garlic bread. Simple and classic! (And even more special by candlelight). I've never frozen my tomatoes whole. Doesn't it make them mushy? I made what seems like a gazillion jars of tomato sauce this past fall. Your sauce looks delicious, and I never would have thought to pop them into the freezer whole! I always let the whole "I don't have canning supplies" keep me from accepting offers of big batches of tomatoes, but I will use your idea next time. Jen, freezing does make them a bit mushy. I wouln't eat them raw as when they're fresh, but I've found for making sauces or using them as part of a cooked dish, frozen works great! your sauce looks very delicious.thanks for the recipe.your kitchen looks cosy. 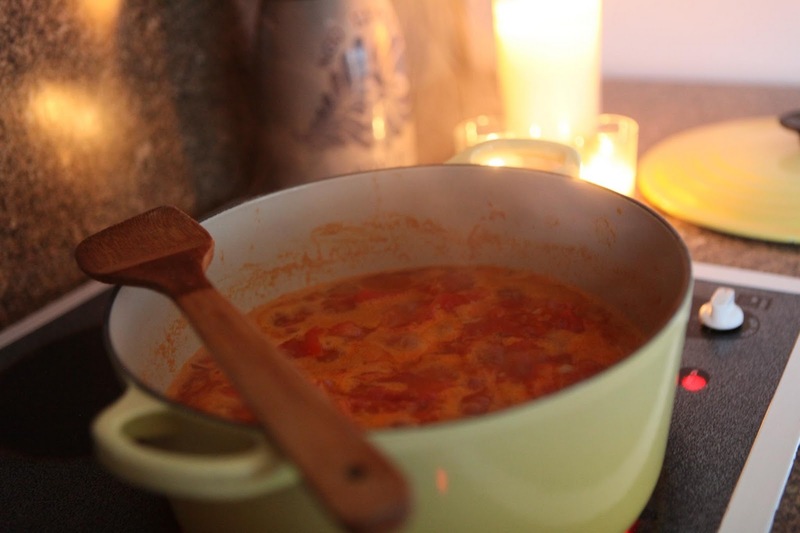 Is there anything better than the smell of fresh tomato sauce bubbling on the stove? Mmmmm! Ha! We finally decided it was time to thaw the whole, frozen, garden tomatoes from the summer and make sauce yesterday! Great minds must think alike! But, your sauce cooking adventure wins. Ours didn't have mood lighting! Looks yummy. We bake our tomatoes (so very easy) into sauce. I will have to remember to freeze some whole though if I get overrun next year. I know this comment is entirely off topic, but I was curious..what is the purpose of your goats? Meat, Milk, or Entertainment? I would never have thought of candlelight to cook by....lovely thought! I was just about to make something similar as my Dad brought us down a huge bag of lovely tomatoes from his garden at Christmas and i never thought to freeze them whole until he mentioned it....great for cooking when you get to it! Hope you managed to enjoy your sauce by candle light too! !Looks yummy...makes me wish it wasn't so hot here right now! I'm going to remember your tip about freezing the tomatoes whole for this summer. Thanks!! Delia, our goats are primarily for keeping vegetation down in the two pastures, and we also use their (composted) manure as fertilizer. They certainly are very entertaining, and tend to charm visitors, so those are added bonuses :) Pygmy goats also make excellent pets for children. We've been looking into breeding the gals, as I would love to have goat's milk, so that's a not-too-distant future goal. Eventually, I'd like to keep some fiber goats as well! (but that's a more distant future dream). Thanks for asking, I love talking about the animals! Don't you just love having tomatoes stored in the freezer? Your recipe sounds divine. Oh yummy, thanks for sharing this recipe :). Great tip about freezing the to atoms whole too. In NZ, our marinara sauce is quite different and used with seafood dishes. 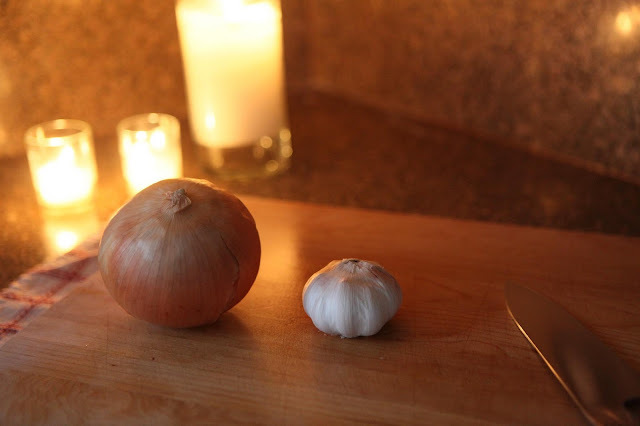 Such pretty photos - everything is fun to do by candlelight...even making marinara sauce! Jamie - Made this sauce last night - DELICIOUS! Lacking my own tomatoes (I'll be working on that this year!!) I used canned whole tomatoes instead. And I didn't blend it, just smooshed everything as it cooked with my big wooden spoon. Thank you for sharing this simple and wonderful recipe! I'm pretty sure I'll never buy sauce again. 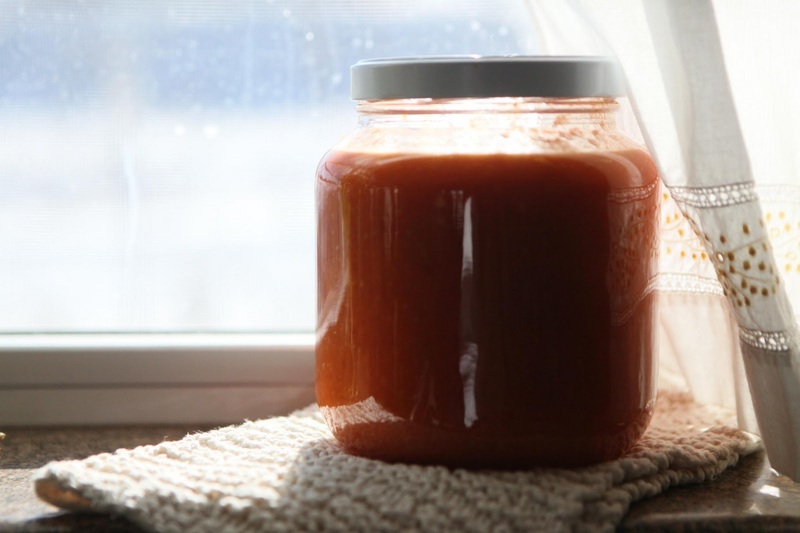 I'm a huge fan of homemade ketchup. Especially if you can get it from organic tomatos. The taste of it homemade is amazing.